It had always been a wish, a plan to visit Mysore on our yearly trips to Bangalore, India. In undergrad, years ago, I had made a day trip to Mysore, but that was before my interest in history, my development of my photographic skills or my passion to promote our beautiful world. This year, with 3 weeks in India, we found the time. 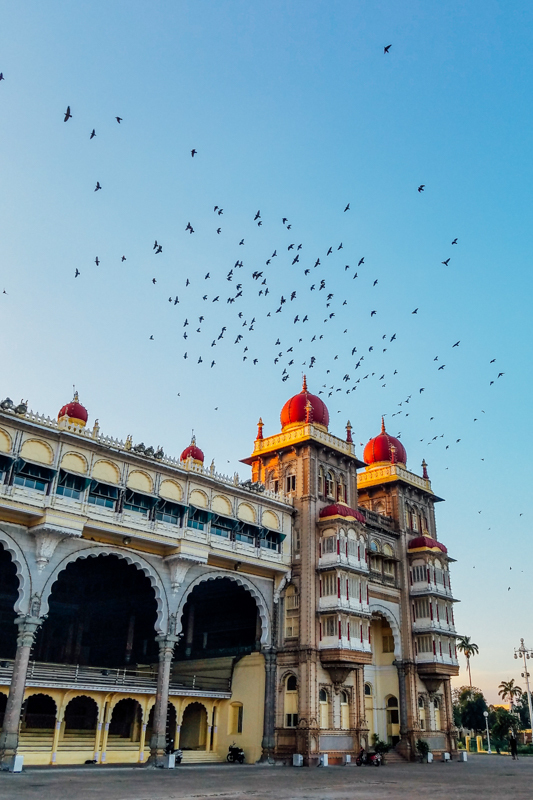 Mysore and the surrounding districts are filled with history, art, architecture and culture and is completely worth spending a few days in. Mysuru, as it is now called, is 150 km southwest of Bangalore. Unfortunately, though the national highway is well maintained, getting in and out of Bangalore is chaotic and the trip can take 4 hours. It is best to leave either early in the morning, or after the peak office hours in the late morning. Once out of the city limits, the drive becomes easier with free flowing traffic and plenty of pit stop facilities. We stopped in Kamat Lokaruchi, a vegetarian restaurant designed to resemble a village, and stretched our legs and quenched our thirsts with fresh sugarcane juice. A few kilometers from the restaurant is Channapatna, the Toys City, a city famous for its wooden toys. There are plenty of shops by the road side or visit the craft market in the heart of the town to pick up your handcrafted top or toy train. Three kilometers further, is the Sri Navaneetha Krishna Temple, or Sri Aprameya Swamy Temple. The temple houses the idol of Ambegalu Navaneetha Krishna (crawling Krishna with butter in hand), and is believed to be the only deity of Lord Sri Krishna in this pose. The famous Kriti (musical composition or song) “Jagadodharana Adisidale Yasode” was composed by Purandaradasa, a prominent composer of Carnatic music, in appreciation of the beauty of this idol. Listen to the song on You Tube. The temple is over 1000 years old, and the temple complex provides a great place to relax as it might have for many through the decades. Devotees also pray at the this temple, for the birth and well being of children. Mysore served as the capital city of Kingdom of Mysore for nearly six centuries, from 1399 until 1947. The Kingdom was ruled by the Wodeyar dynasty, except for a brief period in the late 18th century when Hyder Ali and Tipu Sultan were in power. The Wodeyars were patrons of art, culture and architecture and contributed to the growth of Mysore. We ate lunch at Gufha, a cave themed restaurant, complete with Shikari Shambu servers, and fake snakes and scorpions on the wall. The restaurant is managed by Pai Vista Hotel and is listed in the Top 10 Mysore restaurants. We didn’t have great expectations for the food but were pleasantly surprised. We started our sightseeing in Mysore, with the Mysore Palace. It is the second most visited tourist destination in India after the Taj Mahal, with over 6 million visitors a year. Her Majesty Maharani Vani Vilas Sannidhna, and her son, the Maharaja of Mysore His Highness Rajarshi Krishnaraja Wodeyar IV, commissioned the British architect Lord Henry Irwin to build a palace in 1897. The construction was led by B. P. Raghavulu Naidu who was Executive engineer in the Mysore palace division and the palace was completed in 1912. It is clear that no expense was spared at the time, as materials were sourced from all over the world and India as each room competes with the other for grandness. The Palace also plays host to the Dasara festival with parades and performances through the entire festival period. A tour guide is recommended for the palace to learn the history of the Wodeyars as you marvel at the riches within the walls. If you visit during Dasara, you might get a chance to the see the Golden Throne, covered in 80 kilograms of gold and a royal seat that could truly win the Game of Thrones. The palace grounds is also home to many temples, and are worth visiting. We ended the day with dinner at the Hotel Royal Orchid Metropole, built by the former Maharaja of Mysore in 1920 for his distinguished guests as a guesthouse. The cool winter breeze wafted into the open-air restaurant bringing with it the aromas of north Indian delights, kebabs and curries. We dined like Rajas. Day 2: We started early, as we planned to do a day trip to ancient Hoysala temples in the Mysore district. Somanathapura is a town located 35 km from Mysore, and is famous for the Chennakesava Temple (also called Kesava or Keshava temple) built by Somanatha, a Dandanayaka (commander) in 1268 CE under Hoysala Empire King Narasimha III, when the Hoysalas were the major power in South India. The Keshava temple is one of the finest and most complete examples of Hoysala architecture and is also one of the best preserved Hoysala temples. The temple is in the care of the Archaeological Survey of India (ASI) and is a protected heritage site. As we entered the temple, we were greeted by numerous school kids who were all there as part of their field trip, each dressed in their school colors, and each seeming more interested in their friendships than in the imposing structure in front of them. They were young, and history only comes alive after you’ve taken care of everything else you need. In Somanathapura, as the guide spoke and highlighted the art and architecture of the temple, history did come alive. Hoysala architecture bloomed in the 12th and 13th century. Their lathe turned columns are half engineering marvel and half magic, while their bay ceilings are art and science competing for superiority. The sqaure (interior) and star-shaped (exterior) windows are ingenious and the sculptures are full of life and stories. The temple at Somanathapura was built 100 years after the temples at Belur and Halebidu (Click to see Photos of Belur and Halebidu) and the development of their skill is clearly evident. The interior has 16 domes and each shows the progression of a banana flower in bloom. The main idols were damaged in wars, denying them to be worshiped, and thus it doesn’t get the visitors it deserves, which is a shame. Every visitor that visits the Mysore palace needs to make the hour trip to see this. The temple was built by Soma, a Dandanayaka in 1268 C.E. under Hoysala king Narasimha III, when the Hoysala Empire was the major power in South India. In search of more Hoysala architecture, from Somanathapura, we proceeded 30 minutes to the east, to Talakadu, a sleepy town on the banks of the river Kaveri. Talakadu was captured by the Hoysalas from the Cholas in the 12th century. In celebration, Hoysala King Vishnuvardhana built the Kirtinarayana temple (Keertinarayana) in 1117 A.D. This is the earliest of the group of Hoysala temples in Karnataka, and it shows that while he had the temple layout and structural design mastered, he was yet to incorporate the intricate sculptures. “Let Talakād become sand ; let Mālangi become a whirlpool ; let the Mysore Rājas fail to beget heirs.” uttered Mysore queen, Rāni Alamelamma before drowning herself in Malangi. This is the curse of Talakadu, and ever since the 16th century, the town has been covered in sand dunes, burying the temples and the Wodeyar family, against whom the curse was issued have not had an heir to the throne since. Today, many temples including the Kirtinarayana, Pathaleshwara, Maruleshwara, Arkeshwara, Vaidyanatheshwara and Mallikarjuna temples have been excavated while it is believed that still more than 30 are under the sand. A 2 km, covered path has been added for easy access to all the excavated sites, though walking on sand is not the easiest. The path also leads to the Kaveri river bank where you can dip your toes, swim or cross the river on a coracle, a round boat. The water level varies depending on the rains and how much is released to Tamil Nadu downstream. Day 3: Kids love zoos. We must have visited a zoo in every city we’ve traveled to and Mysore was no exception. Zoos are also exhausting and a good breakfast is a must before heading out. The Green Leaf Food Court was perfect. They serve food through the day, changing the menu accordingly and the staff are very friendly. The Mysore Masala Dosa was just right, and one can never go wrong with a vada. Mysore Zoo, officially, Sri Chamarajendra Zoological Gardens was created in 1892 on 10 acres of the summer palace of Maharaja Sri Chamaraja Wodeyar, and was originally called the Palace Zoo. The zoo was originally set up by G.H. Krumbiegel, a German landscaper and horticulturist. The zoo opened to the public in 1902 and since then has been expanded to include many new species and even a bird sanctuary. The zoo is one of the oldest in India but also one of the best. The animals are extremely well cared for, the enclosures are clean, and the layout is very easy to follow. There are lots of animals and lots of information on the animals. The entire path is 3km, and at about two-thirds of the way there is an excellent cafe. The zoo gift shop is well stocked and worth contributing too. The zoo is funded primarily by the entrance fees but there is also an innovative adoption program where patrons can contribute directly to the welfare of the animals. We spent the majority of the day at the zoo. Leaving Mysore around 4 pm, we headed to Srirangapatna, a town that is completely enclosed by the river Kaveri to form a river island. The river splits into two flowing around the island. Tradition holds that all the islands formed in the Kaveri River are consecrated to Sri Ranganathaswamy, and large temples have been built in very ancient times dedicated to that deity on the three largest islands. These three towns, which constitute the main pilgrimage centers dedicated to Ranganathaswamy, are Adi Ranga at Srirangapatna, Madhya Ranga at Shivasamudra and Antya Ranga at Srirangam. Devotees try to visit all 3 temples in one day, starting early in the morning, upstream at Srirangapatna and ending the day in Srirangam in Trichy. The Ranganthaswamy temple is one of the oldest, with inscriptions from 984 A.D. from the Ganga dynasty, before the Hoysalas took over in the 12th century and made renovations to it. The temple is protected by the Archaeological Survey of India as a monument of national importance. Srirangapatna became the de facto capital of Mysore under Hyder Ali and Tipu Sultan. The state ruled by Tipu extended its frontiers in every direction, encompassing a major portion of South India and Srirangapatna flourished as the cosmopolitan capital of this powerful state. In 1799, in the Battle of Seringapatnam, Tipu Sultan was killed within the fort of Seringapatam, betrayed by one of his own confidants; the spot where he ultimately fell is marked by a memorial. Getting into Bangalore is tiresome with the evening traffic in the city testing your end of vacation patience, but if you stop over in Madduru, and get the Maddur vada to keep you company you should be good. It is made of rice flour, semolina and maida flour which are mixed with sliced onion, curry leaves, coconut and asafoetida. All the ingredients are fried in little amount of oil and then mixed with water to make a soft dough. A small amount of dough is taken and made into a patty and then deep fried in oil until it turns golden-brown to make Maddur vada. A perfect end to a perfect getaway from Bangalore. Gorgeous photos and a wonderful blogpost 😊 Having spent a few months in Mysuru, it was amazing reliving these memories from your blog ! Thanks! Please check out http://www.beautifulworld.photography/IncredibleIndia. Would love to hear your feedback. Also please share this with your friends.